After living in Norwich, Watford, London and Sussex and visiting often since 1995, it deserved its own category. 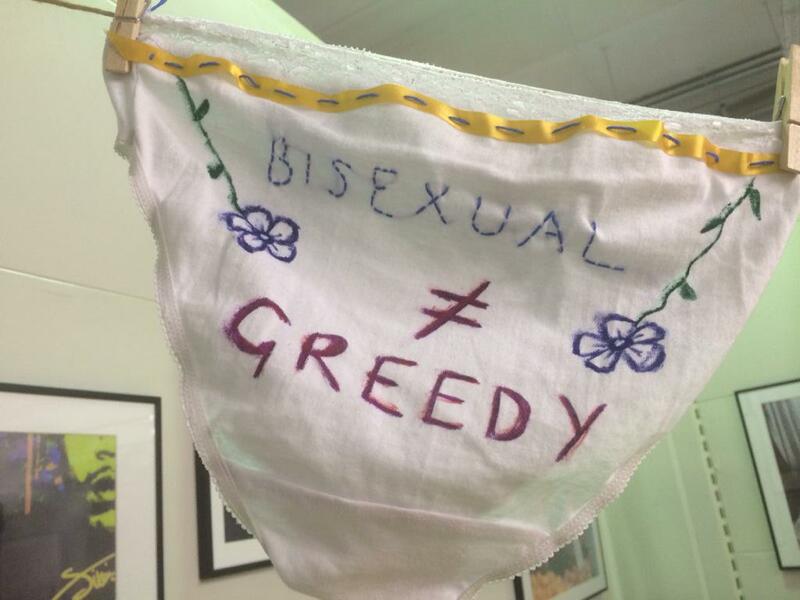 By Betsy on August 28, 2015 in craftivism., england. One of the coolest things about technology is that it helps us access items from all over the world. Enter the amazing power of libraries and you hit the jackpot. As craftivism is nothing new, I love coming across old books and booklets that help people make things for others, especially those in need. 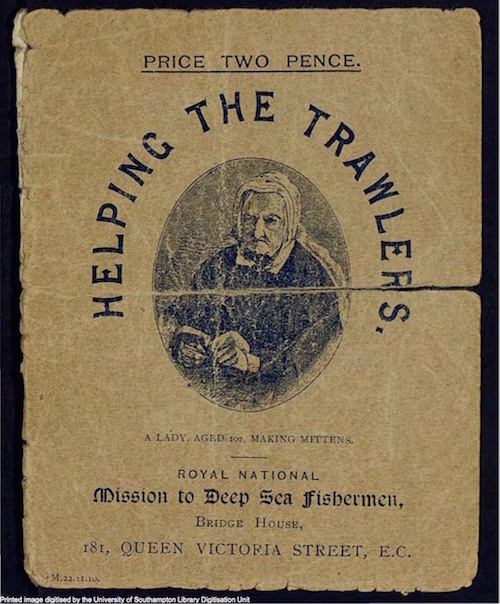 Therefore, I was especially happy to find the two books (click for PDF) in the University of Southampton’s digitized library collection, which is a literal virtual treasure trove of crafty goodness. 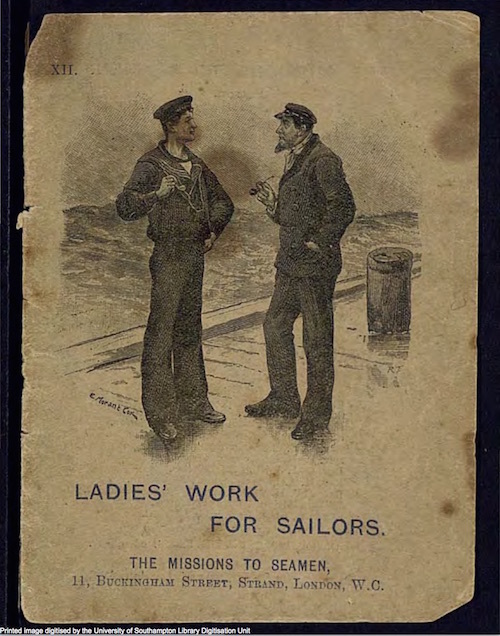 And it’s not just the patterns that are fascinating either, the ads within are amazing, too! Also, if you’re a knitter, the University of Southampton also houses the Richard Rutt collection, which is quite fabulous. 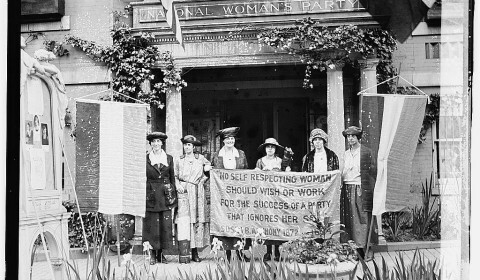 From a more modern perspective, check out this amazing video by Craftspace about why craftivism is important! The video is about an event that has already happened, but some super important points are made as to why craftivism can be helpful, poignant, and healing. Like this post? 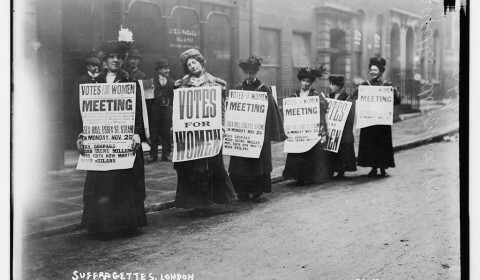 Get weekly updates on what’s happening in the world of craftivism each week by signing up for my newsletter! 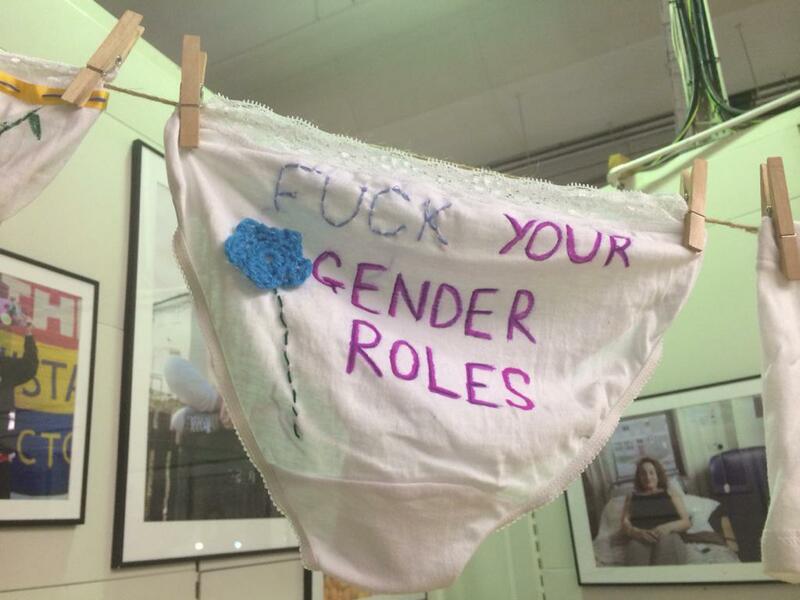 By Betsy on August 21, 2015 in crafters + makers., craftivism., england. 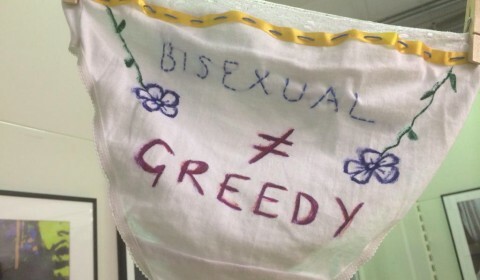 The other day on Twitter, @CraftspaceYouth mentioned having a workshop on sexuality and gender roles, which I found by searching the #craftivism hashtag, as I look at it from time to time to see what craftivists around the world are up to. 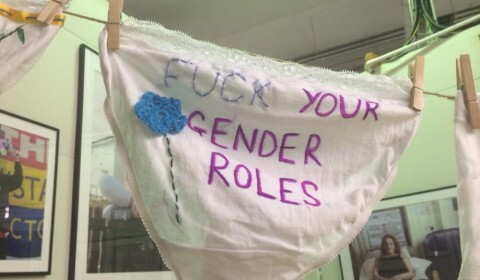 One thing I’m super proud of is the variety of work that people come up with, as they take craftivism and make it their own, tailoring it to the subjects that they care most fervently about in life. In this case, this workshop tackled a sensitive issue for many and, as you can see from the photos below, the takeaway here is that everyone has a right to feel safe in their body and to love the person(s) they want to love. What I love about this project is that it allowed young people a safe space for discussion and dialogue, where they could make work that expressed how they’re feeling inside and then talk about those feelings with others. 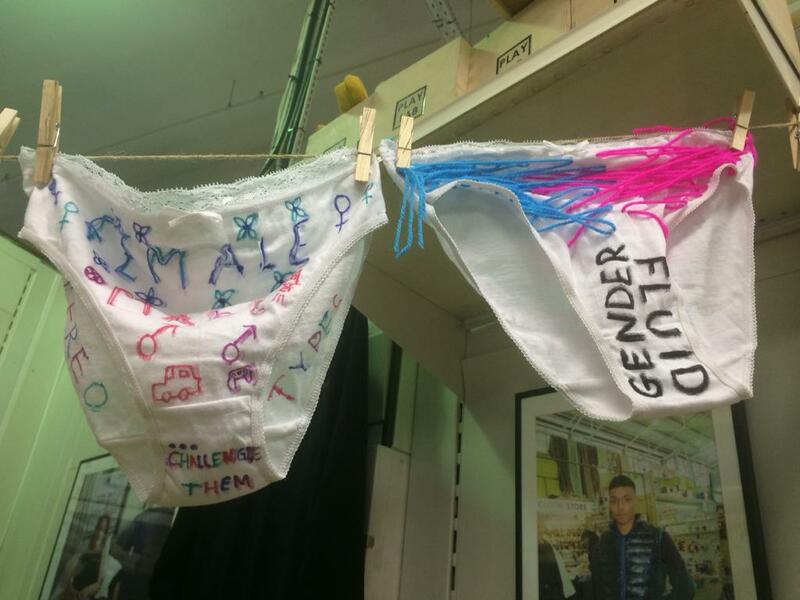 This is what makes craftivism so personally transformative, this chance to work out your feelings as you craft, both internally and externally. 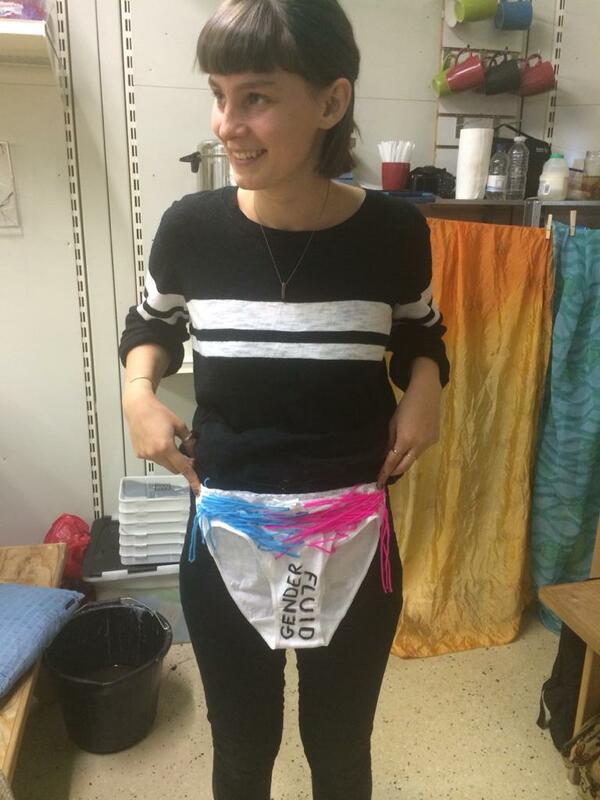 As I’d like to share more of the craftivist projects that people are doing on here, I asked them to send me some photos of the workshop, which they did! Craftspace Youth is the youth section of Craftspace, am amazing “crafts development organisation” in Birmingham, UK that works with communities and artists to produce fantastic results! Ever since I had the chance to hear the director speak a few years ago in London I’ve had such an incredible crush on the work they do! 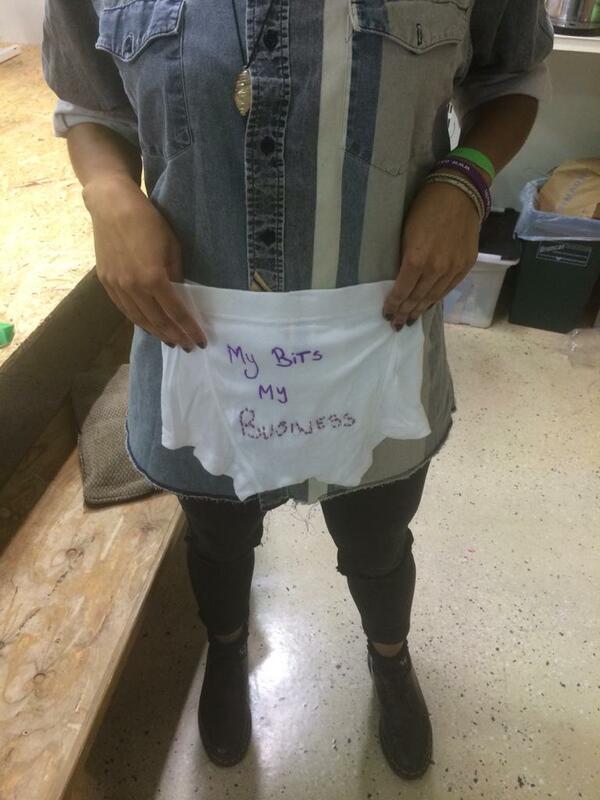 Thanks @CraftspaceYouth for sharing your workshop photos with me, and for doing the great work that you do! 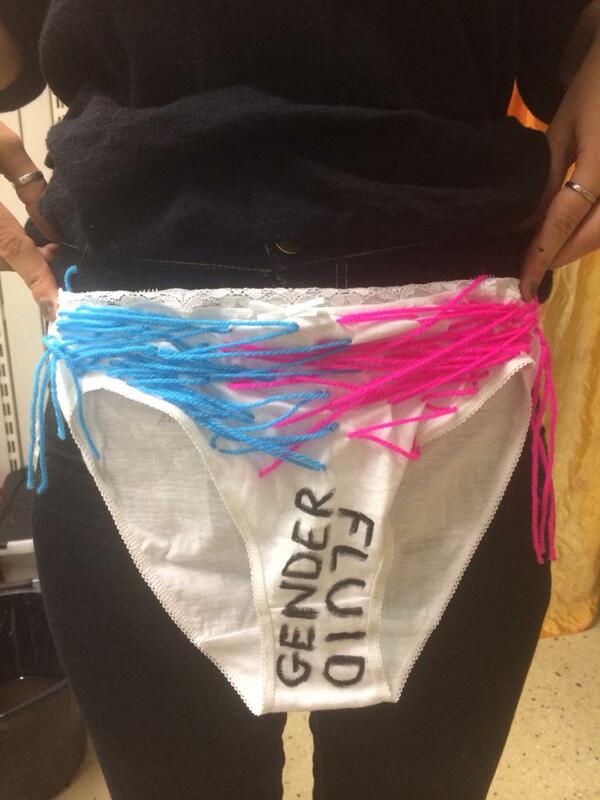 By Betsy on June 10, 2015 in crafters + makers., craftivism., england., why handmade. 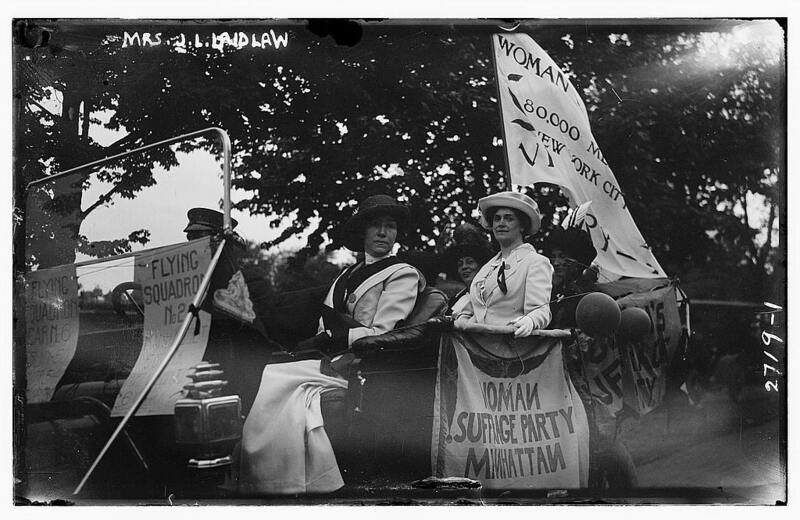 I’ve been writing some posts on craftivism for the Fabrics Store blog, and the one that comes out on Friday features suffragette banners, along with Gandhi and the Madres de la Plaza de Mayo. 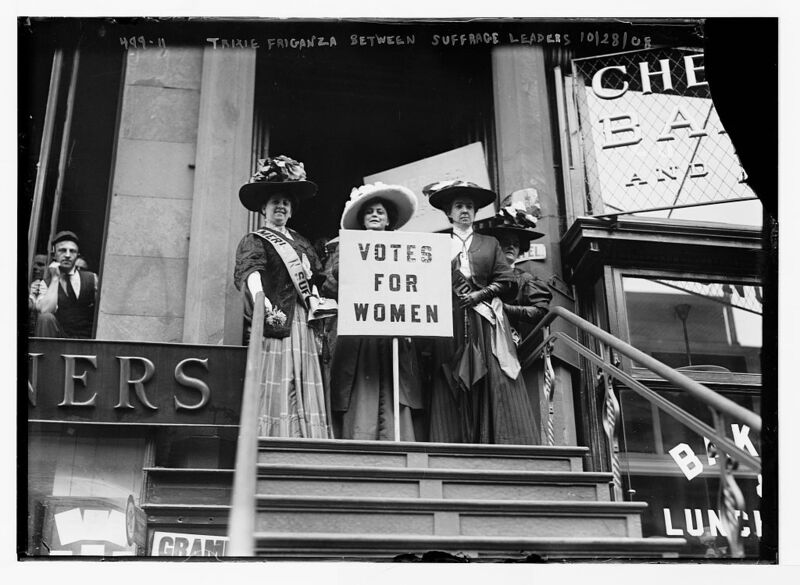 As I was looking for photos for that blog post, I came across the large photo collection of suffragette photos from the Library of Congress, and was amazed at all the different ways women used to get their message across. There are just a few of them below. Please note that the photographs are in thumbnail version, so that if you click on them, they revert to their original size, allowing you to view them in more detail. 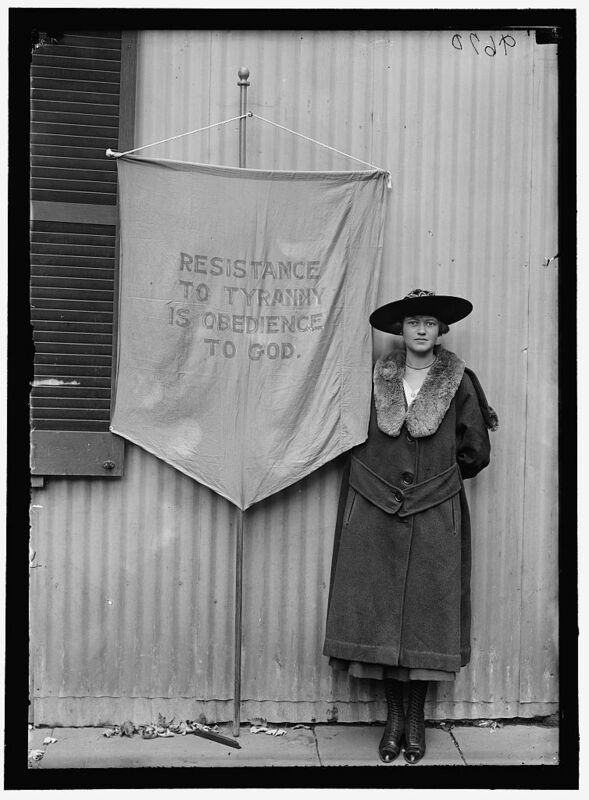 A 1917 photograph by Harris & Ewing of an unidentified suffragette. 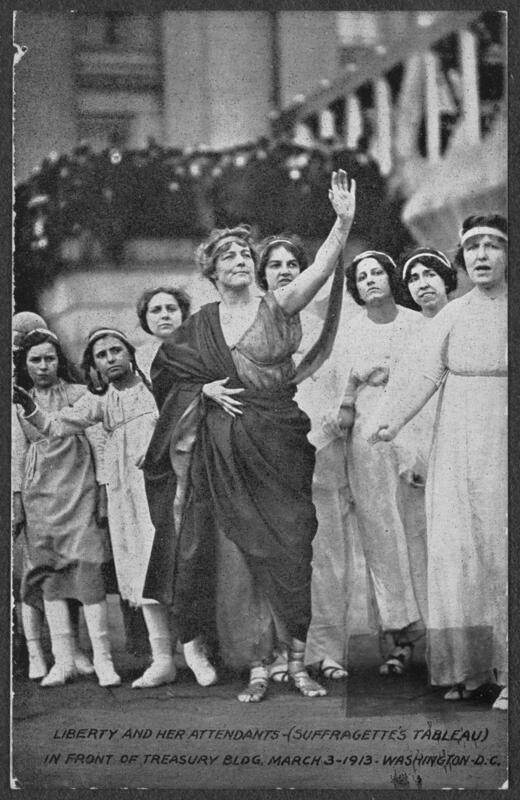 Trixie Friganza between other suffragettes on top of steps, New York, 1908. 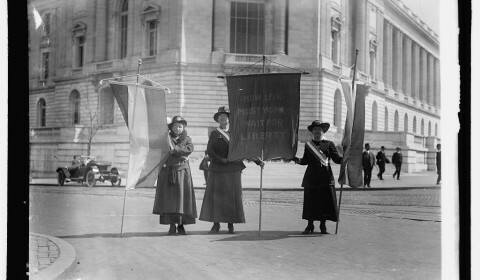 Liberty and her Attendants (Suffragette’s Tableau) in Front of Treasury Building, Washington, DC, March 3, 1913. 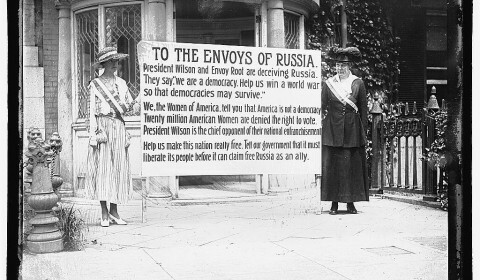 Suffragettes at the White House, 1900. 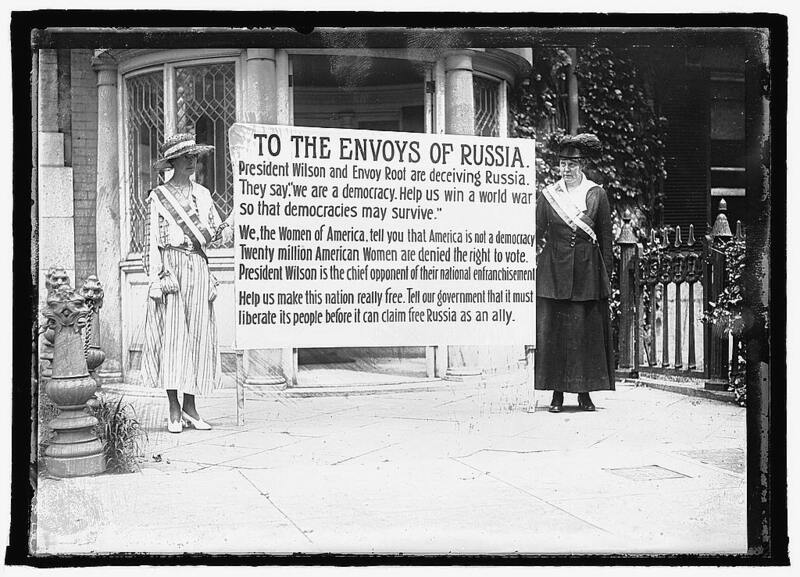 Suffragettes in Washington, DC, 1917. 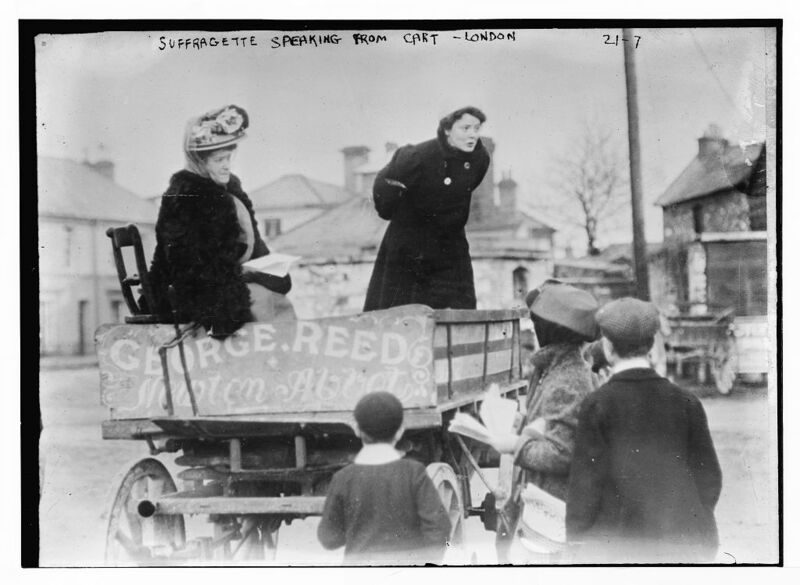 Suffragette speaking from a cart, London, 1900. 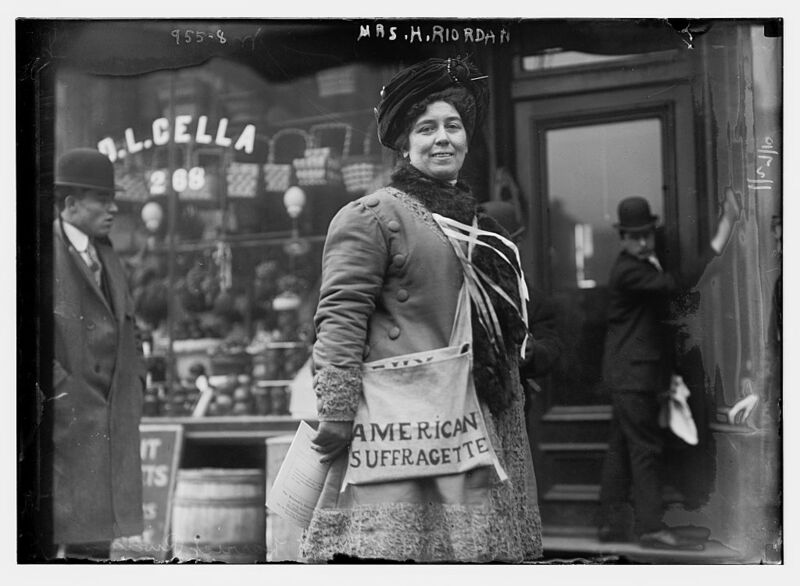 Mrs. H. Riordan, Suffragette, New York, 1910. 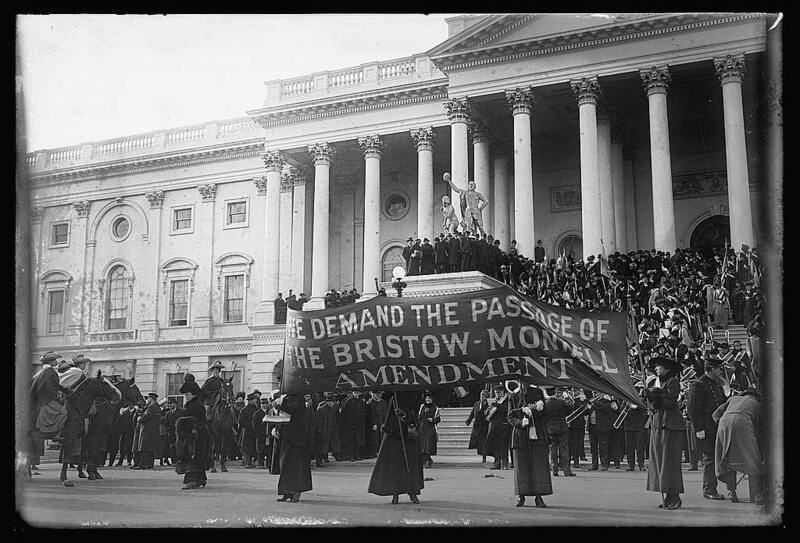 Suffragettes picketing at the Senate Office Building, Washington, DC, 1909. 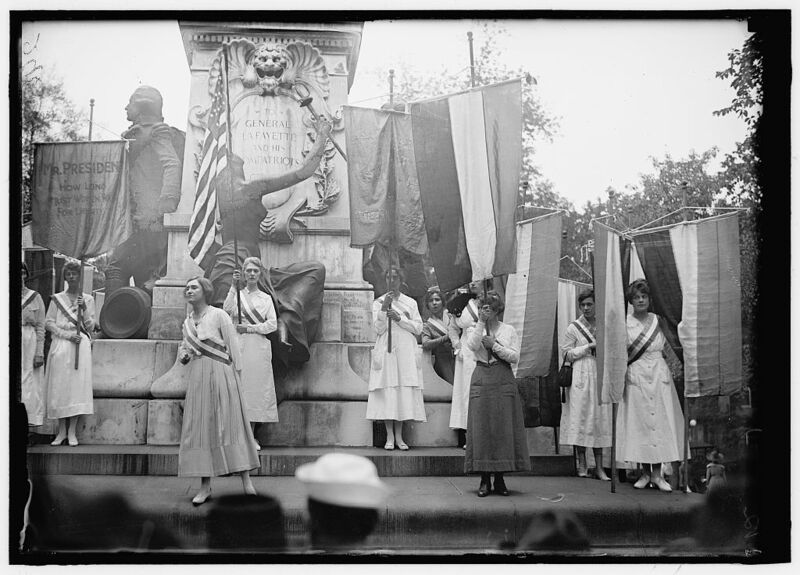 Suffragettes in Washington, DC, 1910. 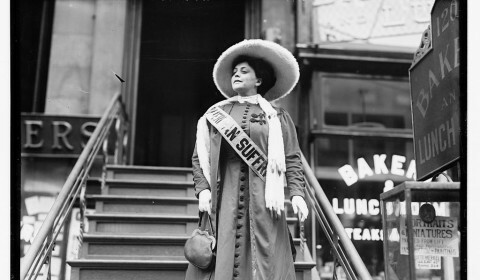 Margaret Vale (Mrs. George Howe), niece of President Wilson in suffrage parade, New York, October 1915. 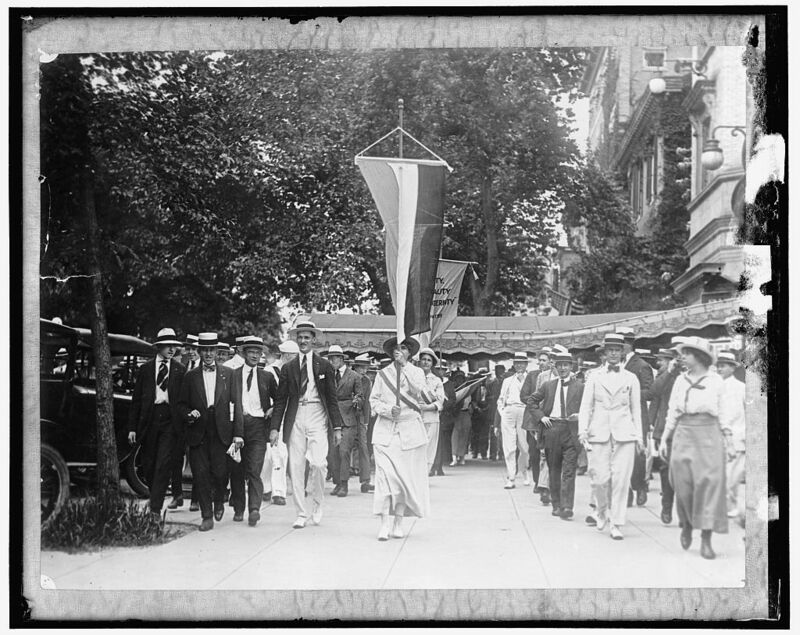 Suffragettes in Washington, DC, June 1917. 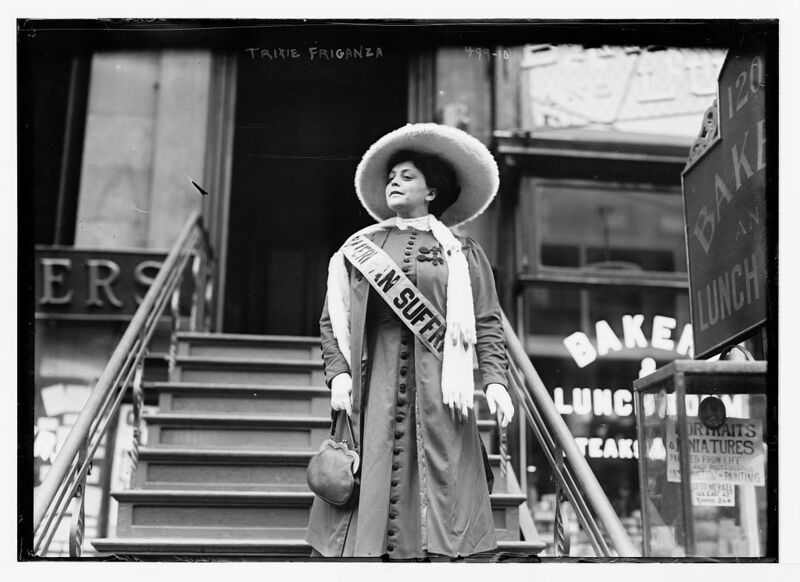 Suffragette Trixie Friganza in New York, 1908. 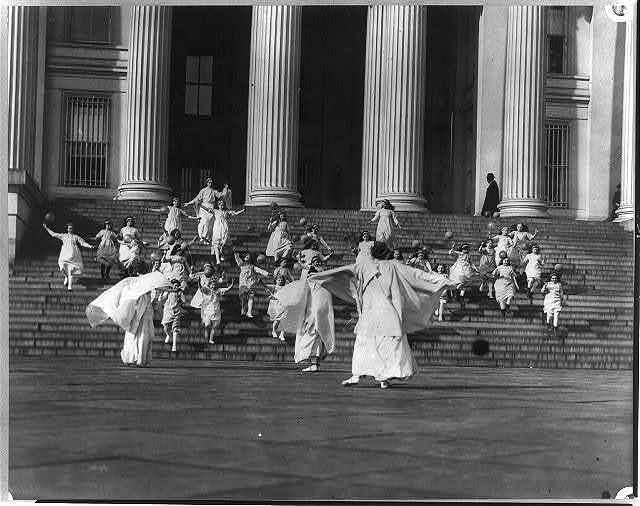 Suffragettes and young girls carrying balloons, running down the steps of the U. S. Treasury towards three awaiting women, Washington, DC, 1913. 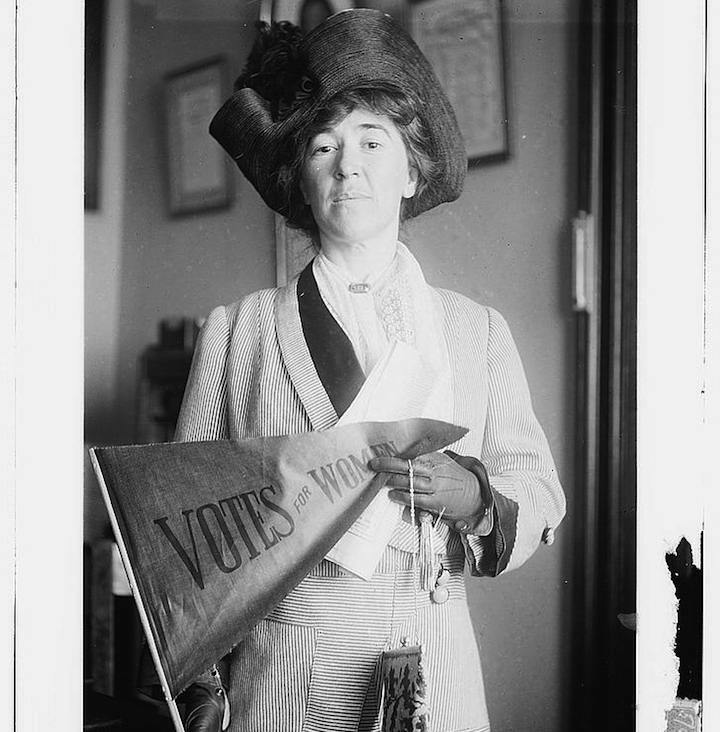 Mrs. J. L. Laidlaw, suffragette, 1910. 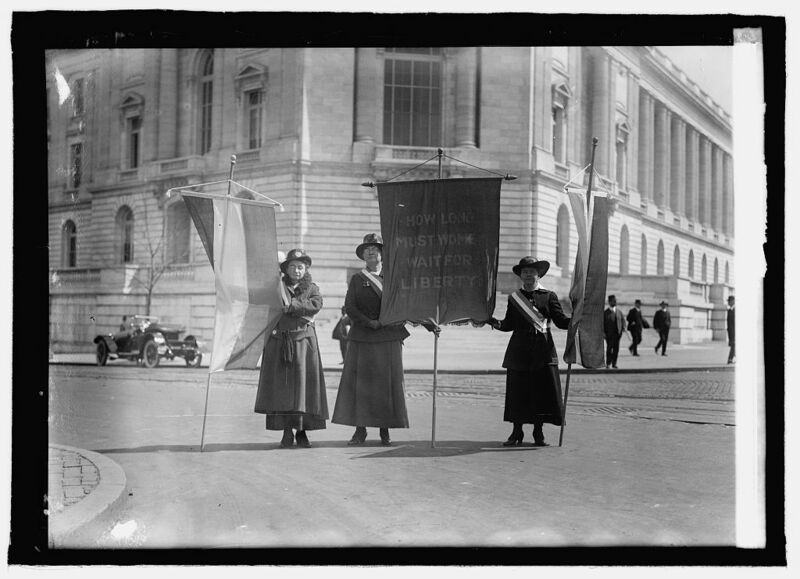 Suffragettes with banners in Washington, DC, 1918. 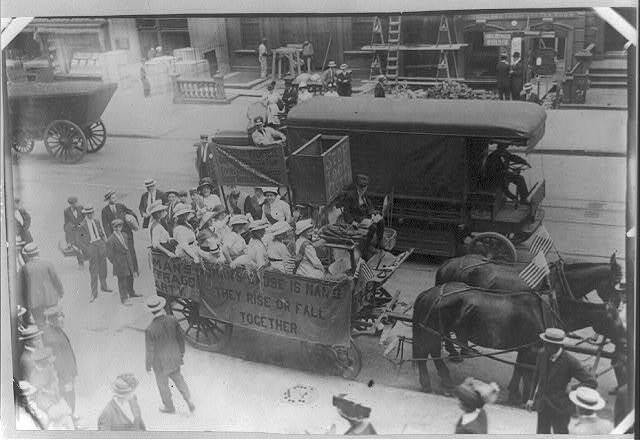 Suffrage hay wagon, Yonkers, New York, 1913. 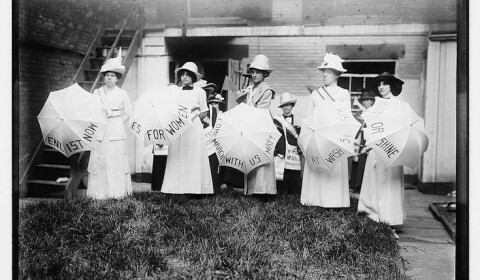 Suffragettes and their umbrellas, 1910. 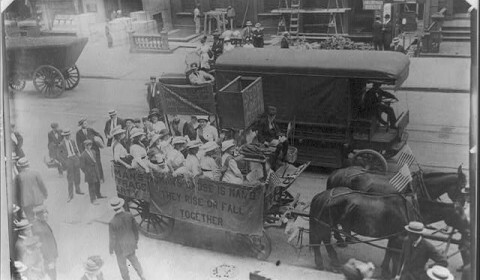 Women suffrage hikers General Rosalie Jones, Jessie Stubbs, and Colonel Ida Craft, who is wearing a bag labeled “Votes for Women pilgrim leaflets” and carrying a banner with a notice for a “Woman Suffrage Party. Mass meeting. Opera House. Brooklyn Academy of Music. 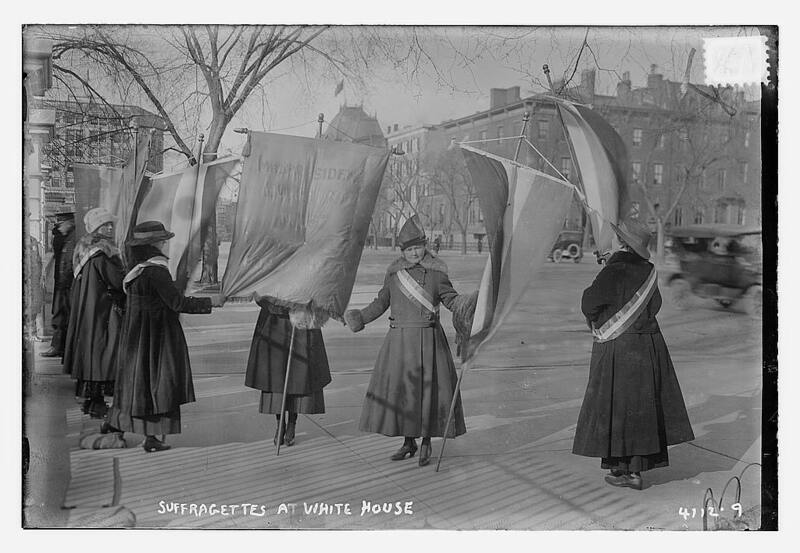 January 9th at 8:15 p.m.
A tiny, yet mighty, suffrage banner. 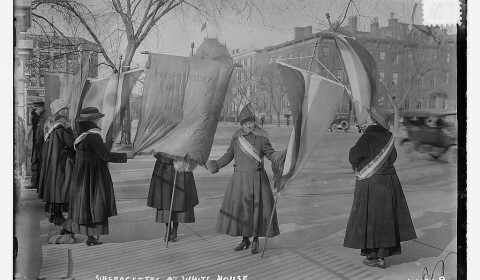 Suffragettes with banner, Washington, DC, 1920. 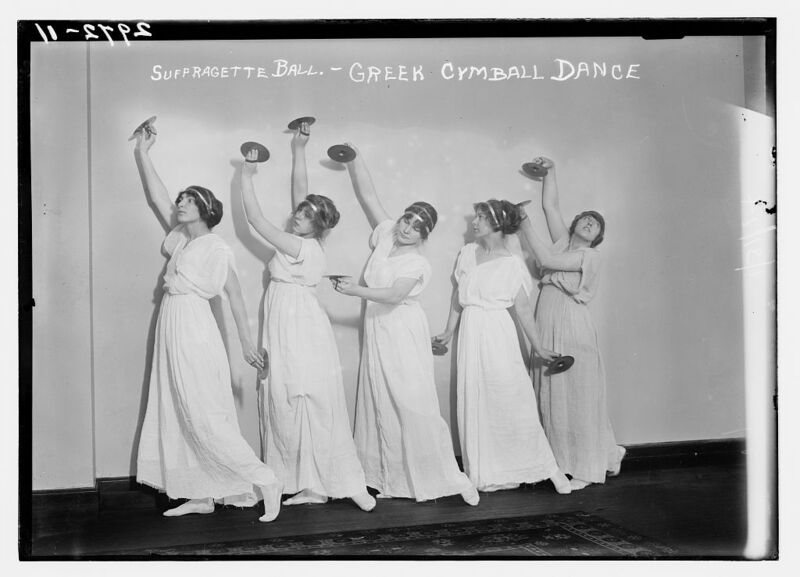 Suffragette ball Greek cymbal dance, Washington, DC, 1918. 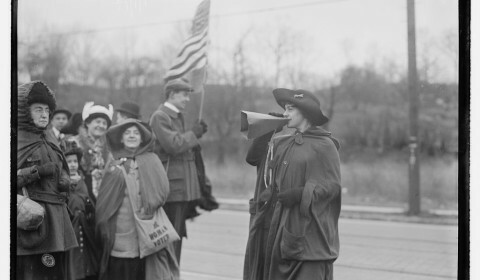 More info on Louisa Pesel! 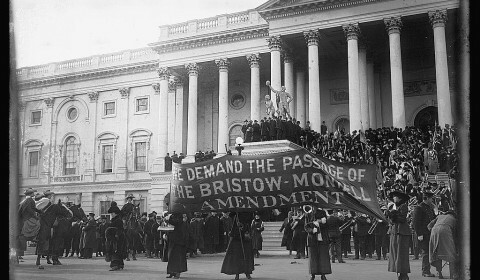 By Betsy on May 8, 2014 in #HistCraftivism, anti-war., crafters + makers., england., volunteering., why handmade. One of the great things about having a blog or website is that you never know who will find you or be reading… and just this on its own an be so exciting! 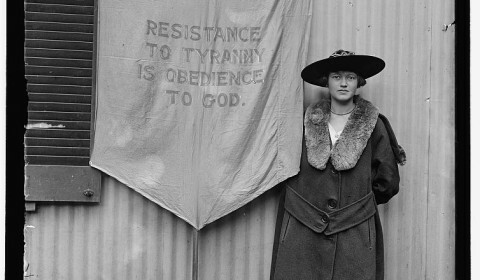 Well, after my post about Louisa Pesel the other day and noting that there wasn’t much information about her online, I got an email from one of the women who organized the Ecclesiastical Embroidery exhibition in Bradford Cathedral in 2010, who kindly provided me with more information! Yeah! 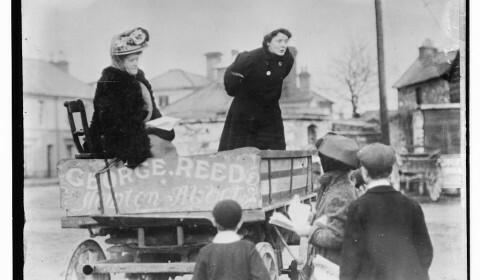 Dear Betsy, I came across your Craftivism blog posting of 13th April, regarding Louisa Pesel, and you say you’d like to hear more about her. 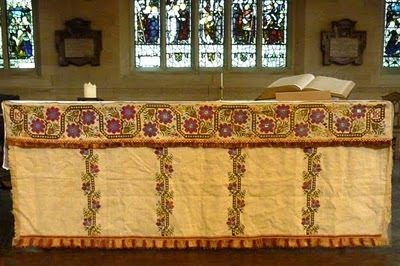 I was one of a small team who organised an Ecclesiastical Embroidery exhibition at Bradford Cathedral in 2010, which is where the “Khaki Frontal” was displayed. The photograph that you have posted of it (in the Cathedral) would have been taken at this exhibition. This Khaki Frontal is composed of the Super Frontal (the top piece), which was made by the shell-shocked soldiers in 1918, and the Frontal (the larger piece), made by their teachers in 1919. It was made for the Abram Peel War Hospital, as you say, and it was given to Bradford Cathedral for use in the Bolling Chapel, in memory of them after the War. The Bolling Chapel was reordered as part of the extension of the Cathedral in the late 1950’s. We are currently hoping to raise money to have the Khaki Frontal on permanent display in the Cathedral, as it is such a unique and interesting piece. This frontlet was worked by shell-shocked soldiers, in the autumn of 1918, at the Bradford Khaki Handicrafts Club, for use at their services at the Abram Peel Hospital. 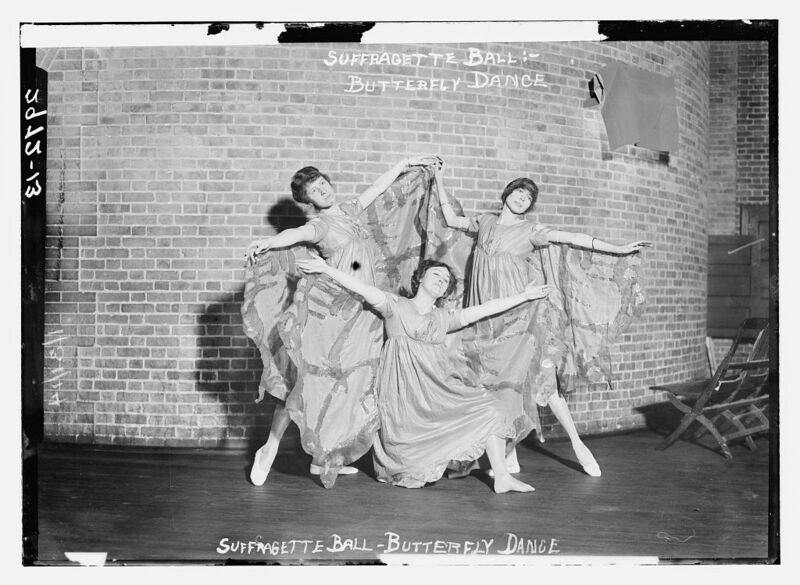 It was lengthened and the frontal added by their teachers in 1919 and was accepted, in memory of them, for the Bolling Chapel in 1920. 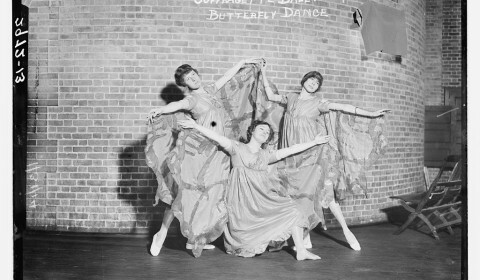 The Bradford Khaki Handicrafts Club was established to provide occupational therapy and employment for men returning from the First World War, using embroidery. The Abram Peel Hospital was opened in 1915 as a specialist neurological hospital, and by 1919 had 437 beds. It was sited at Leeds Road. 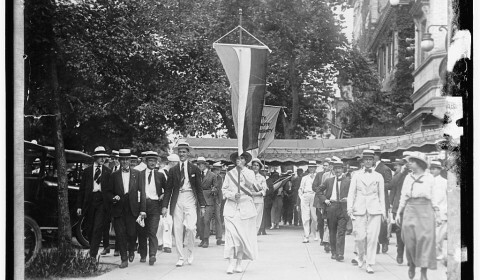 Louisa Pesel was instrumental in getting the Khaki Club established; she was born in 1870, the eldest daughter of the Bradford cloth merchant Frederick Pesel, and his wife Isabella. 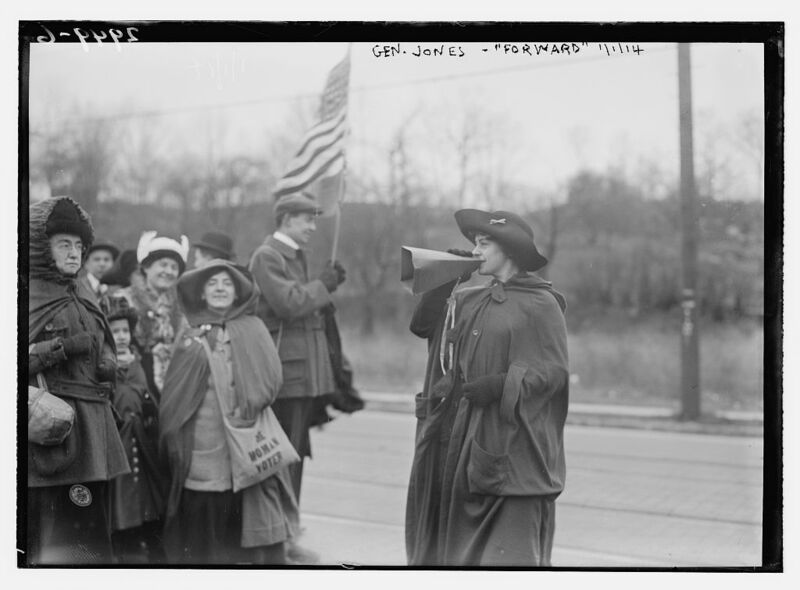 She studied drawing and design under Lewis Foreman Day, a contemporary and close acquaintance of William Morris. 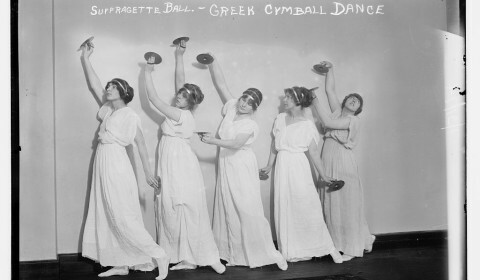 She was appointed in 1903 as designer to the Royal Hellenic School of Needlework and Laces in Athens, and she acted as director of the school until 1907. 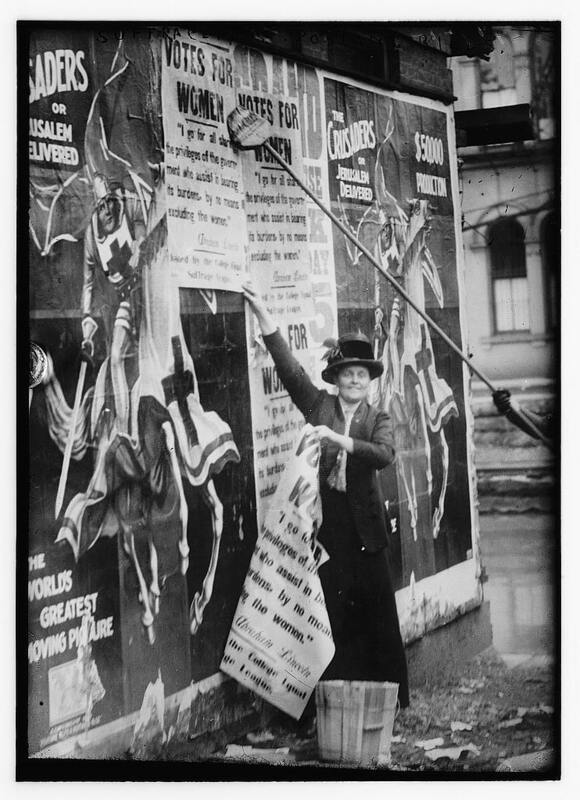 On her return to England she became an inspector of art and needlework, and well known lecturer. 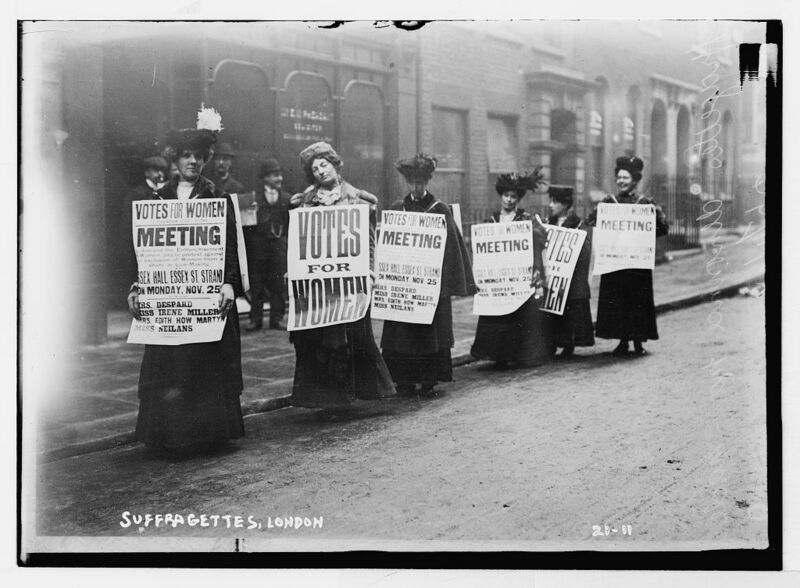 In 1920 she was elected as the first president of the Embroiderer’s Guild of England. 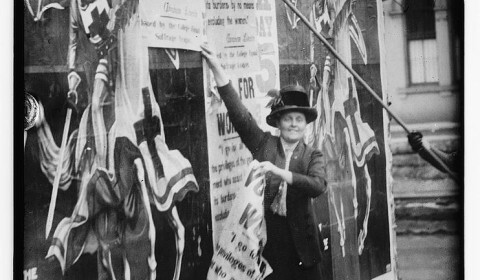 In 1932 she founded the Winchester Cathedral Broderers with the object of providing the stalls and seats with cushions and kneelers, and she became Mistress of Broderers there in 1938. The embroidered motifs in the design of the super-frontal and frontal here are similar to motifs from Greek island embroideries, which were one of Louisa’s favourite areas of research. Those on the frontal are similar to motifs from the island of Rhodes. 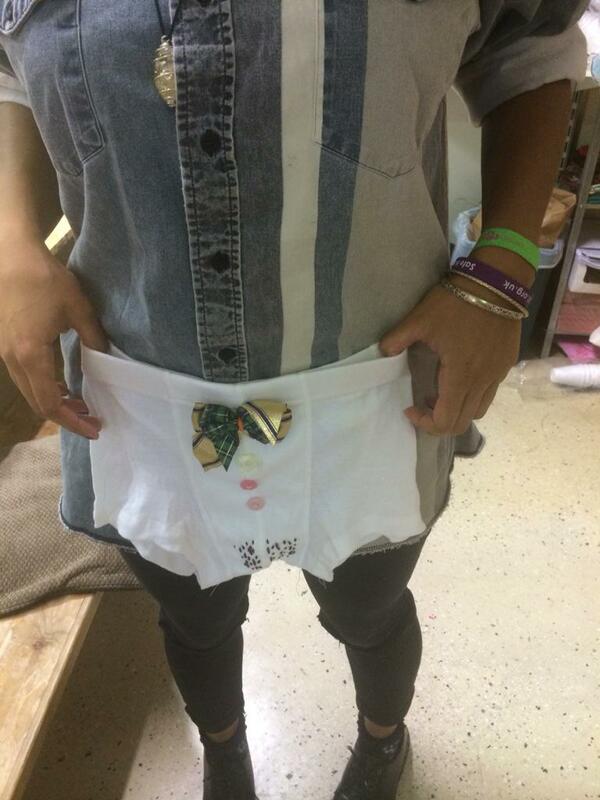 They are worked in cross stitch, which was used in the majority of Louisa’s own projects. 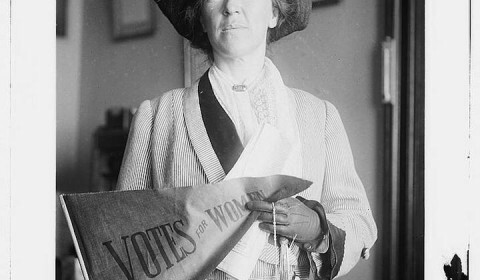 Louisa Pesel died in 1947, and her collection of notebooks, photographs, drawings, and embroidery samples were left to the University of Leeds, and are now held in the University of Leeds International Textile Archive. 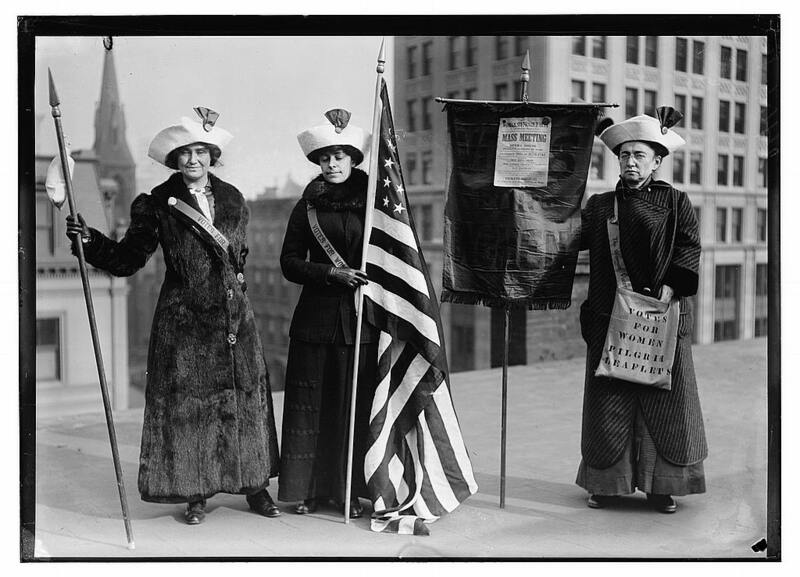 Week #9 of 48 Weeks of Historical Craftivism, Louisa Pesel! 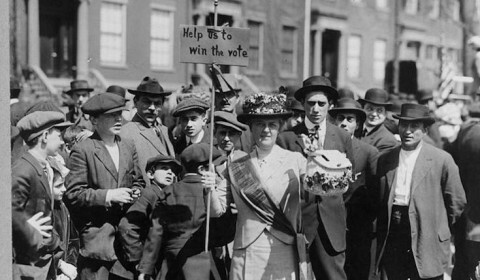 By Betsy on April 13, 2014 in #HistCraftivism, anti-war., charities + orgs., crafters + makers., england., volunteering. 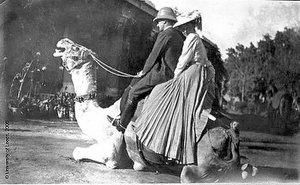 First of all, you may be wondering, what is a woman riding a camel in the Khyber Pass doing on a post about craftivism? 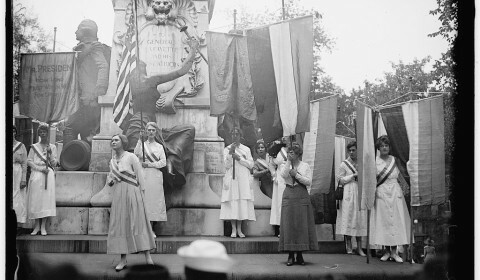 Well, it’s totally related once you realize that that woman on that camel is Louisa Pesel, who helped shell-shocked soldiers and passed out cross-stitch/embroidery kits (some resources say one, some the other) to POWs with the Red Cross. I’ve searched high and low on the internet for more information than provided below, but it’s sparse. If anyone has any more information, I’d love to hear it! 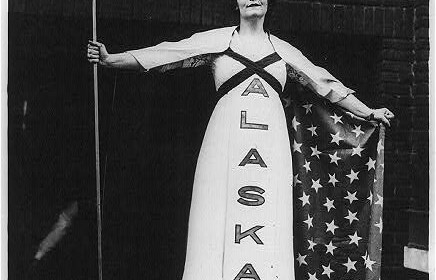 While this week’s entry may be a bit sparse, I hope it helps someone learn about the fabulous work on this amazing woman. 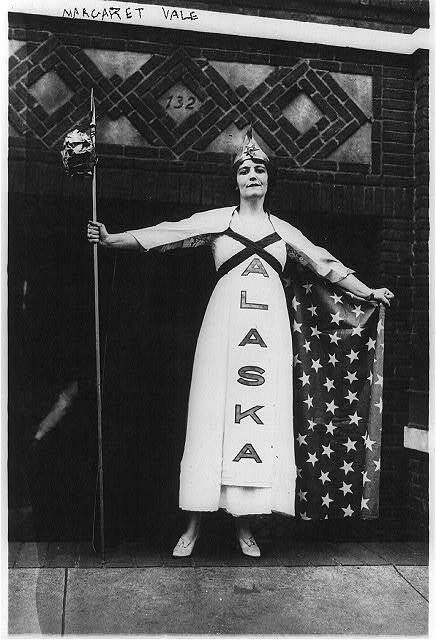 Louisa Pesel is a special hero of mine. Many years ago I fell in love with her notebooks and her meticulously hand drawn charted designs of antique needlework. She was saying, ‘Just look at this, isn’t this design wonderful?’ Having travelled to many countries in the near East, she wanted all the world to see what she, by her good fortune, had seen. 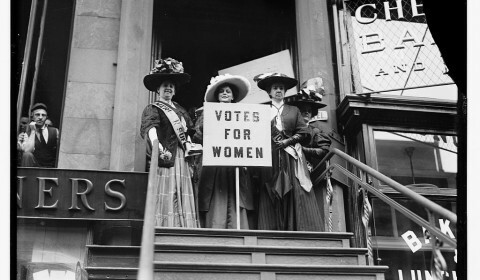 I think it is so important to keep alight the torch she lit. The more so, perhaps, since she was an old girl of my school in Bradford. 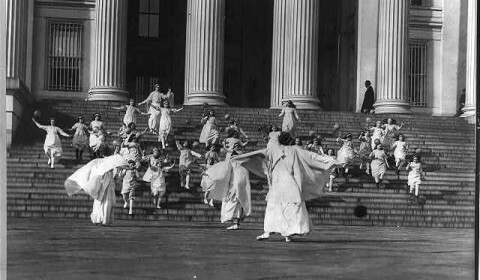 How strange to think that the school founded in 1875 and something of a scandal since it proposed to teach girls mathematics and classics instead of the usual domestic arts, should have been, in its turn, slightly astonished to turn out a scholar with a passion for design and needlework. 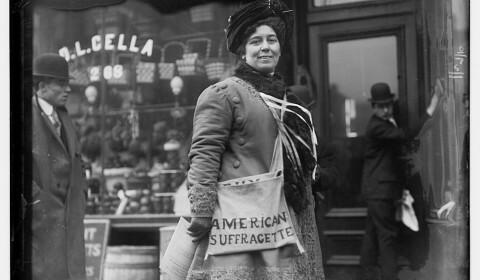 Born in Bradford, Louisa Frances Pesel (1870-1947) was a teacher of embroidery. She studied design under the Arts & Crafts practitioner Lewis Foreman Day, who recommended her for the post of Designer at the Royal Hellenic School of Needlework and Laces in Athens, where she soon became its Director. After returning to England, Pesel worked with shell-shocked soldiers in Bradford, and was involved in establishing embroidery kits for POWs (Prisoners of War) during the Second World War. More than 90 years ago, in the final year of the First World War, steam trains daily brought injured soldiers into Bradford for hospital treatment. Among these hospitals was the 437-bed Abram Peel Hospital in Leeds Road, a military establishment for neurological disorders, staffed by the Royal Army Medical Corps, Queen Alexandra’s Imperial Military Nursing Service and volunteers. 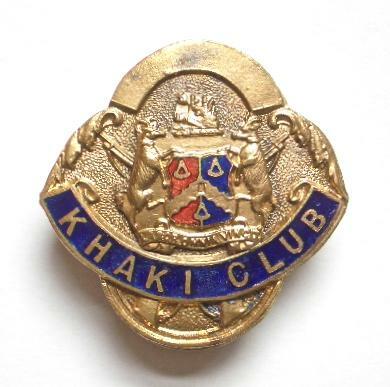 A club was formed to help them, the Bradford Khaki Club, based in Forster Square. 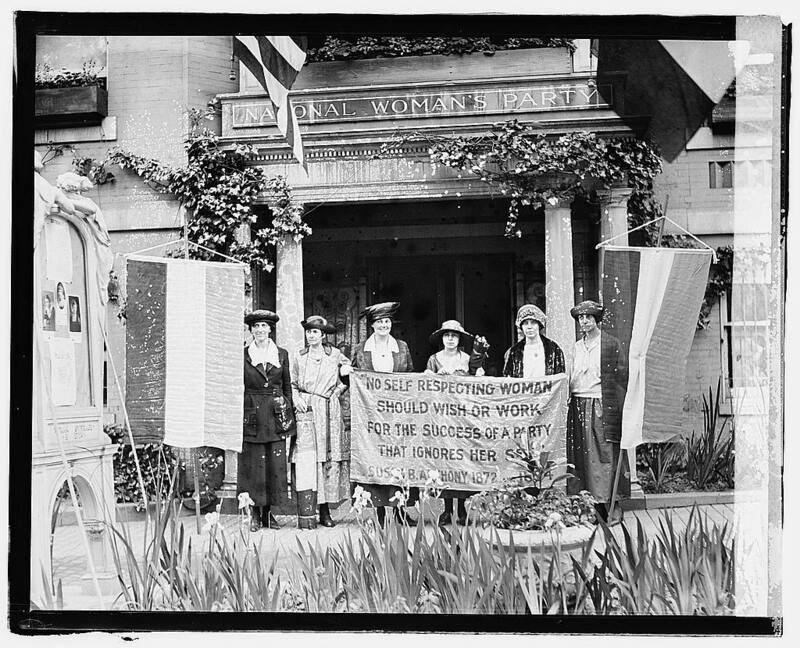 Khaki Club members were also taught embroidery by Louisa Pesel, the Bradford-born daughter of a German merchant. 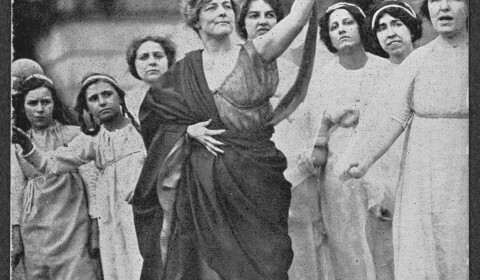 She was in her 40s, a noted scholar and embroidery expert who had been director of the Royal Helenic School of Needlework and Laces in Athens. She helped some of them to embroider what is known as the Khaki Cloth, a cross-stitch frontlet made at the club in the autumn of 1918 for use at services in the Abram Peel Hospital. The Bradford Khaki Club was formed in the First World War to help the many shell shocked and injured soldiers brought home for hospital treatment. 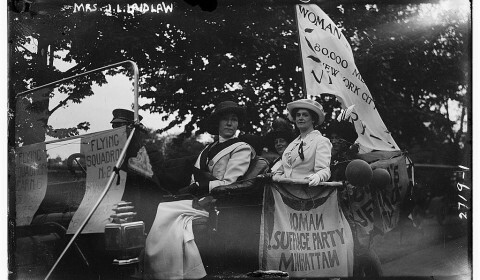 It had a restaurant, games room, library and held concert parties, members were also taught to embroider by Louisa Pesel (first President of the “Embroiderers Guild of Needlework”), some of whom helped embroider what is known as the “Khaki Cloth”, a cross-stitch frontlet made in 1918 and used at services in the “Abram Peel Hospital” in Leeds Road a Military establishment staffed by the Royal Army Medical Corps and the Queen Alexandra’s Imperial Military Nursing Service. 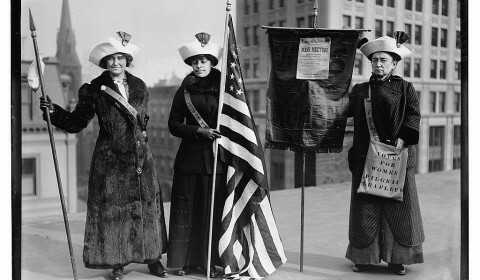 Along with all of this amazing work, she was also world traveled and master embroiderer. 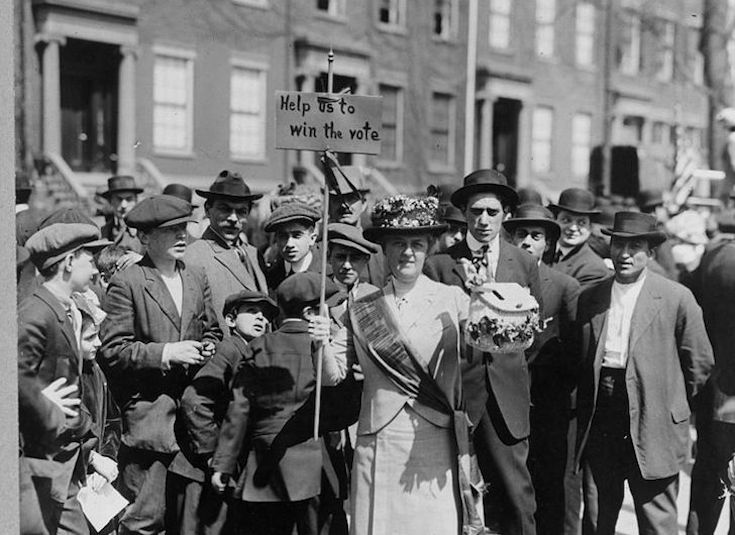 One of the founders of the Khaki Club was Louisa Pesel, a relatively well to do 46 year old woman, whose war efforts also included assisting Belgian refugees and raising money to provide ambulances for use at the Front. 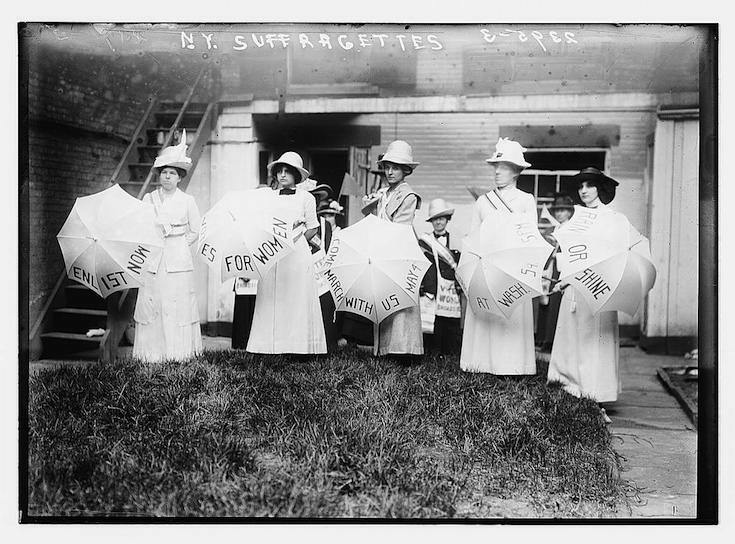 She was also an expert embroiderer, and used this as therapy for the soldiers.